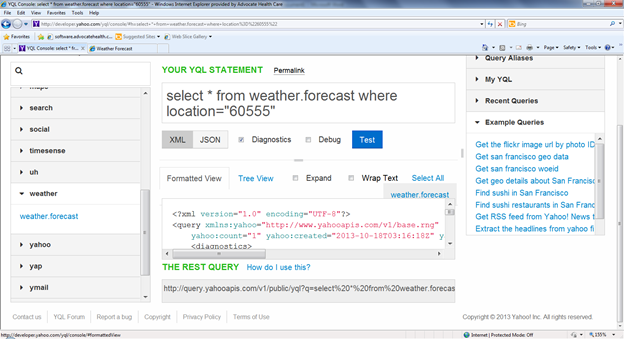 Introduction: How to link your application with Yahoo Weather API using Yahoo!Query Language (YQL) and JQuery? What is YQL? The YQL Web Service enables applications to query, filter, and combine data from different sources across the Internet. YQL statements have a SQL-like syntax. The following YQL statement, for example, retrieves weather for a location with zipcode=60555. 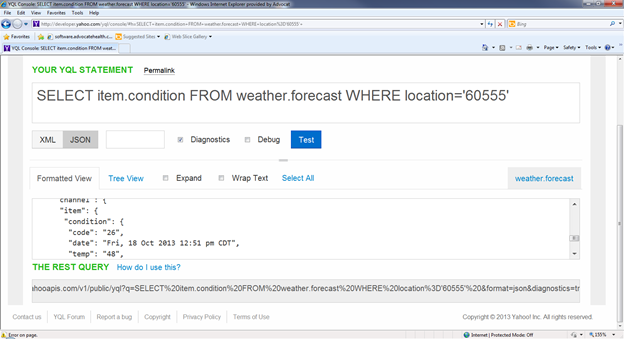 select * from weather.forecast where location="60555"
When it processes a query, the YQL Web Service accesses a data source on the Internet, transforms the data, and returns the results in either XML or JSON format. YQL can access several types of data sources, including Yahoo Web Services, other Web services, and Web content in formats such as HTML, XML, RSS, and Atom. Running the following simple query, you can check the current weather forecast for a specific zipcode. Open YQL Console (http://developer.yahoo.com/yql/console) in browser and type the sql statement. Then click “test” button. You can select “XML” or “JSON” as output format. Here is the output. Check the results.channel.item.condition object. It has code, date, temp and text properties. The code property is used for image. 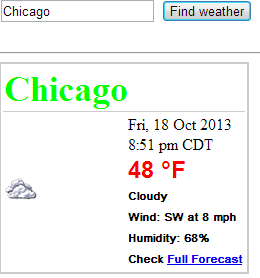 The date property indicates the last updated date, temp indicates temperature and text indicates condition. Everything is wrapped in the documents.ready handler. The button click event (get weather) is inside this handler. The second parameter is the request data. We build the request query with the user input (location) from location textbox and append it to URL with ?q=”select query”. It is URLEncoded. You can copy the ‘REST QUERY’ at the bottom of the YQL Console. The third parameter is the callback function which contains a reference to the returned JSON object(data). By default the Yahoo! Web Services return output in XML format. To get output in JSON format, use the output=json parameter in the request.